As the Sydney visitor grinds by bus along Broadway (we're often not very imaginative in our naming of streets or buildings here in Australia), he or she passes a sight that gladdens the heart of those who are interested in, indeed passionate about, sustainable architecture. I'm a visitor to Sydney myself these days, and I never fail to be uplifted by the vision of One Central Park. This glossy shopping mall/apartment building, erected on the site of an old brewery, was opened in December 2013 and has received many accolades including a five-star green rating and winner of the World's Best Tall Building award in 2014. It has many features of sustainability, but I'm most interested in the hanging gardens decorating the walls of the building. I've learned that these hanging gardens were very challenging to design and build, requiring special planter boxes, each with its own irrigation system, supported by floor slabs in such a way that the plants can grow without disturbing the building's walls. A special mix of soil was used in the planter boxes. As well, there are vertical green wall panels attached to the building. Creator, French botanist Patrick Blanc, insisted that plants could grow on these panels as long as they had something to attach to. There are three layers in the green wall: one of PVC and two of felt. In the outer felt layer, pockets were cut so that plants could be inserted and stapled in. The plants were tested in a wind tunnel to ascertain their suitability for this project as they have to able to withstand gusty wind, high temperatures and humidity. It's hydroponic gardening, and water and nutrients are delivered artificially to the panels from within the building. 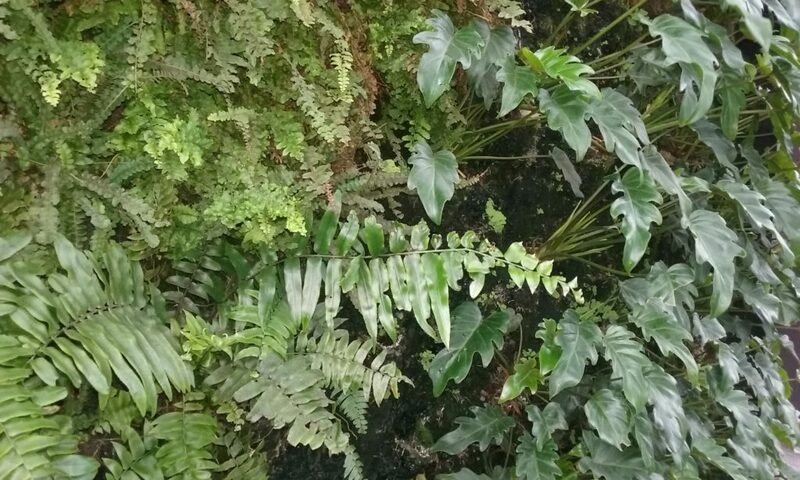 In all, there are about 350 species of plants on the walls, some of which are quite rare: a variety of both exotic and native plants, and mosses. The idea for many of the native plants came from the vegetation found around the Wentworth Falls area in the Blue Mountains west of Sydney. 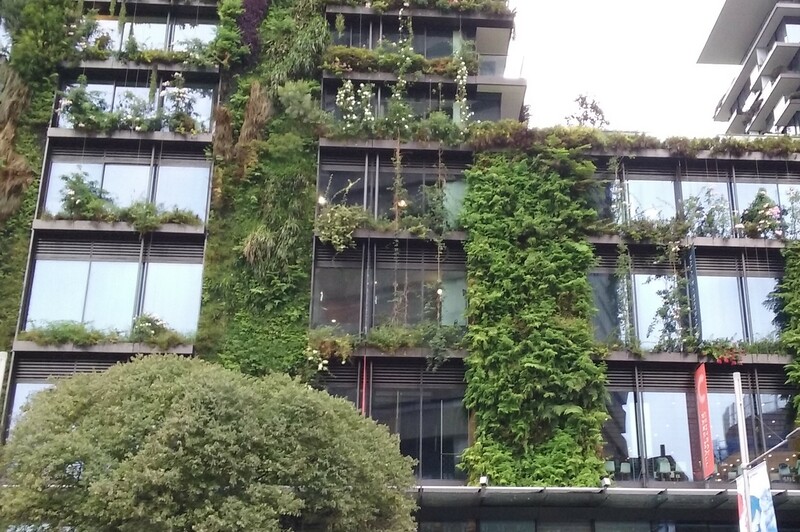 Patrick Blanc said, “the vertical gardens will appear like a natural cliff as though [one has] cut a giant slice of the Blue Mountains and put it in the middle of the city.” Over time, microclimates have developed on the panels. I was outside this building a few days ago and gazed with great pleasure upon it, admiring the lush greenery on its walls and the panels soaring up 33 storeys. It was a grey and rainy day, so in the photos the building appears somewhat sombre, but no matter, I'm sure that even though a bright blue sky is missing, the benefits of this building are apparent: a building that transcends the usual concept of a city building, and brings the benefits of greenery, gardening and nature to the city dweller. Have you experimented with a green wall? Or seen a wonderful example somewhere? I would love to hear about it. Wow, that looks wonderful. I’m glad designers are making our urban buildings/streetscapes greener. It looks like it may have a cooling effect on the building. Yes, I believe it does Tracy. The building also uses the rainwater it collects, recycles grey water and has a heliostat at the top which directs light onto any parts of the park behind it which might lie in its shadow. That building is amazing, even more so with all that greenery. I agree, Vicki. I do hope more like that will be built. We love this area of Sydney, have strolled around there a few times. Your photos are very good and I can see that the “hanging gardens ” have grown a lot since we were there. Thank you, Trish. I agree, there is a lot to see and do there. We had lunch at Spice Alley! It is also right next to Spice Alley, which is a delight for those who like Asian food. Yes indeed, Gerard, we had our lunch there that day! This is beautiful. Would be nice if there were more. Very true, Ali, but Patrick Blanc is working on it! What a great use of space for planting! Have you been inside? 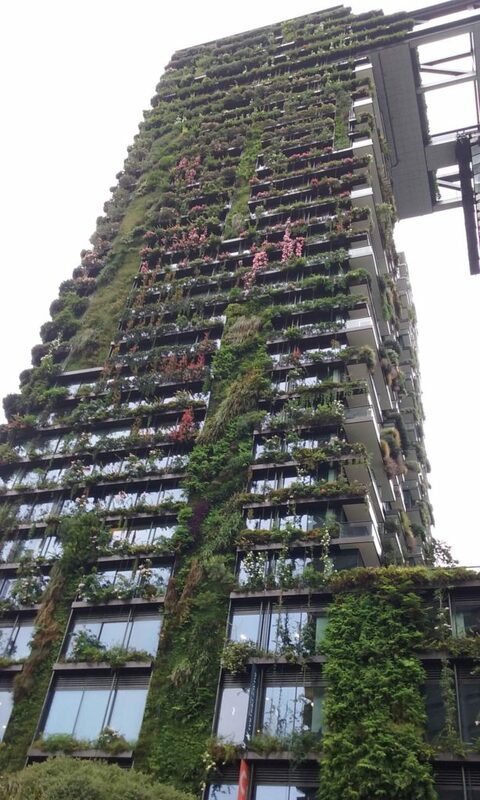 It looks amazing from the outside, I wonder what it’s like to live or work in a building that’s covered in plants. Hi Sarah, yes I have been inside, but only to the shopping/ restaurant part which is much like any other. I believe a lot of people have moved into the apartments above because they like the idea of the greenery, which is maintained by a specialist gardening business. I couldn’t help wondering if you would feel as though you were peering through the windows at a jungle. Of course, the apartments are very smart, and very expensive! Yes, Makiko, heat reduction is one of the benefits of the plants on the building. I guess some of us will just have to make do with less smart, less expensive houses with standard gardens! It’s a lovely building to look at though. Wonderful post! I have a book by Patrick Blanc, but I have never seen one of his actual buildings. So, thanks for the report – it looks fantastic! I’m glad you enjoyed the post Anna. I’ll have to look for Patrick Blanc’s book as it would be very interesting to read more about his philosophy. That is one fabulous vertical garden! I’ve seen a number of Blanc’s gardens (albeit only in photos) and I think this one may be the best yet. Most of the vertical gardens I’ve seen in my own area have been meh. Hi Kris, yes the garden is just wonderful. There are more examples on Patrick Blanc’s website as well as interesting videos of his field trips, which I have been enjoying watching. Hi Pauline, I did see GA, and watched that segment with interest. I’d love to make a (small) vertical garden, but it would be challenging in our area as the plants would have to be hardy to drought and frost, which narrows the selection down to a small number of plants. I have seen, in photos, some wonderful succulent walls with jewel-like colours, but very few of those succulents seem to be frost hardy, unfortunately. Perhaps when I get a bit more cover in my young garden….! Jane I discovered your blog today and find it very interesting since I garden in a harsh similar climate in Argentina. I will add your blog to my list and visit every entry from now on. Greetings! Hi Marcelo, thanks for following me! I’ll pop over to your blog and look at your garden. Wow! Why didn’t I see this when i was in Sydney at Christmas? probably because I was jet lagged. Awesome. I just love it Tim. It’s such an exciting building and a wonderful example of Innovative architecture as well as bringing greenery into the city.